yesterday, after an exhausting weekend of cleaning, packing, and a bunch of pre-moving F-U-N, i was craving something warm, comforting, and- more importantly- something that would serve as lunch for the week. luckily, i already had everything in my pantry and fridge to make a carrot soup. so, boom. 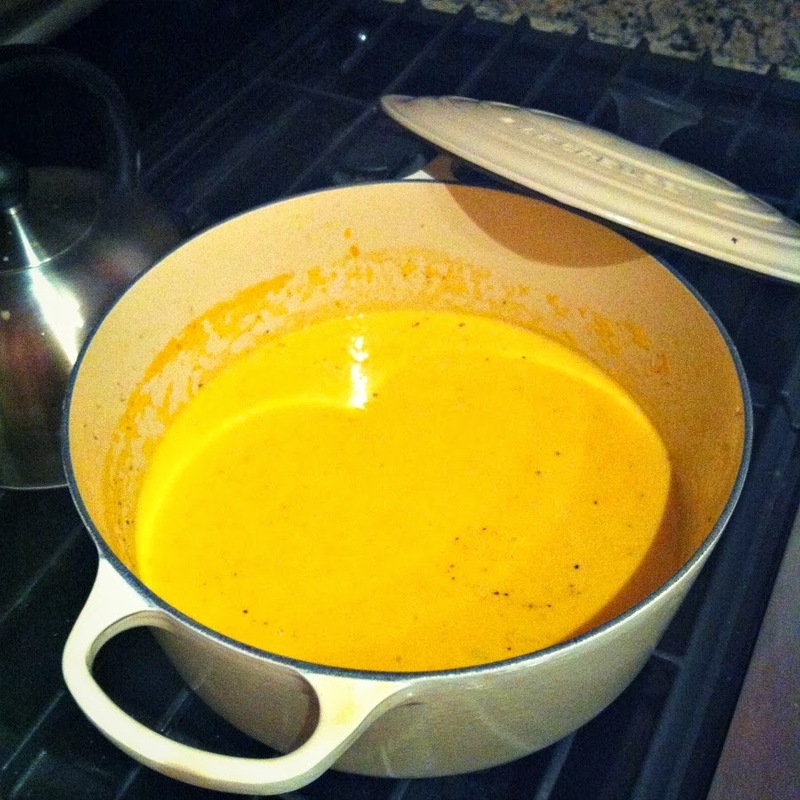 carrot soup was made. and, if i don't say so myself, it turned out pretty fantastic. here's the recipe in case you're interested. in a large dutch oven on medium heat, add the evoo and butter. add onion, garlic, and ginger and cook until onions are softened and beginning to become translucent. add the chopped carrots and parsnips. add the thyme leaves, red pepper flake, tsp sea salt, and black pepper to taste. cook for eight minutes or so until they soften. next, add the chicken and vegetable stock. (you can totally use just chicken or vegetable stock. i just prefer the flavor of the combination.) bring to a boil and then reduce to a simmer. cook for twenty-five to thirty minutes until all of the vegetables are cooked through. turn the heat to low. next, with a slotted spoon, scoop all of the cooked veggies into a blender. (it'd be easier if you had an immersion blender but a regular blender or food processor works just fine; it just creates an extra step.) add about a cup of the stock and purée until completely smooth. you may have to add more liquid to get the consistency that you want. once puréed, add the mixture back to the pot. mix with the rest of the stock. now, add the cup of half and half or whole milk or heavy cream. use whatever you have. bring back up to temperature if the half and half was cold. taste test and determine if it needs any more salt and pepper. serve with a chunk of grilled ciabatta or toasted baguette. garnish with chopped chives.